Tens of thousands of businesses rely on ActiveCampaign to make it simple to close more deals, and easy to deliver the right message to the right people at the right time. We are taking that vision in a bold new direction, a direction that is fresh and innovative, and yet incredibly intuitive. At ActiveCampaign we have a vision of the marketing stack — a modular and extensible system of applications that communicate with each other in streamlined ways. Just like no two businesses are the same, no two marketing stacks are the same. We want to provide our customers with the flexibility to choose the right tool for the right purpose for their specific needs. From shopping carts, to event software, to surveys, and more. The weakness of this stacking approach has always been the quality of the integration. Unfortunately many integrations only pass very limited and basic information about contacts. 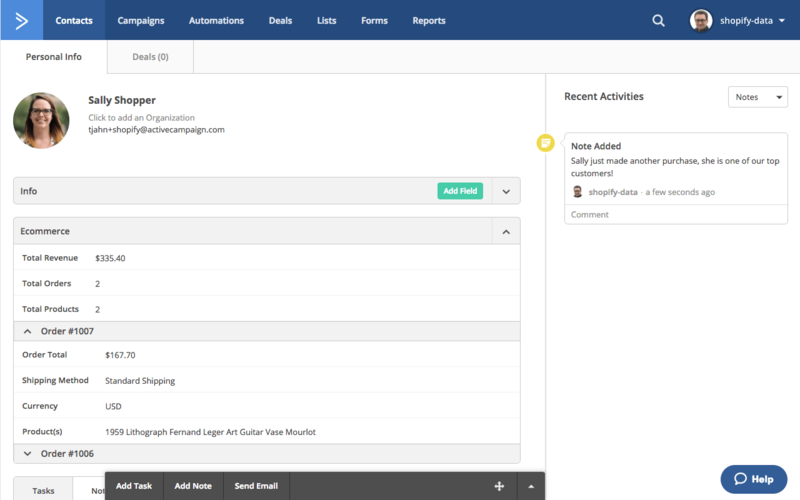 Announcing the first ActiveCampaign Deep Data Integration with Shopify. Deep Data Integrations, pass as much data as possible. The Shopify Deep Data Integration automatically adds intuitive fields to your contact records to organize all the new data. And the integration syncs that data in real-time. You can even pull in historical purchase data that existed prior to connecting the integration. Deep Data Integrations create the highest quality integration possible so that stacking becomes virtually the same as having third-party apps built right into ActiveCampaign. We spoke with hundreds of our ecommerce customers and many of them said the same thing. … so that they can send the most targeted, effective communication possible. But, when only basic customer information is passed onto other apps, it limits their ability to leverage that data. It’s “stuck” in Shopify so it can’t be used to create more personalized marketing. Our new Shopify Deep Data Integration makes it easy to do exactly that. Historical purchase information Shopify generates about your customers, will be available to use inside ActiveCampaign, anywhere you would use the segment builder. That includes campaigns, contacts, lists, automations, and goals. This is just the initial release. Eventually, all of the information Shopify produces about your contacts will be available to use inside of ActiveCampaign. As of this morning, this integration is live and available to everybody who is on the latest Contact & Deals release (if you aren’t you can upgrade here). We have put together a separate setup guide that you find in our help docs. In order to make the most of the new integration we have put together a few use cases for you to noodle over. Your repeat customers — the ones that make a purchase over and over again — are also your most evangelical about your brand. They are the most likely to tell their friends about you and share your referral link on social media. Give them something to talk about every chance that you get. A simple acknowledgement that lets them know that you notice them and how loyal they are as a customer goes a long way. With the new ActiveCampaign Deep Data Integration its easy. I suggest creating Goals for certain revenue thresholds and then using those goals as a trigger in a separate automation to let your customers know how much they appreciate their business. Consider increasing the personalization and level of thanks as they spend more and more. If you are a Shopify Retail POS customer, and you do a lot of business from your brick and mortar location, throwing a private party can be a great way to form a more intimate relationship with your top customers. As an added bonus, it is a great way to stretch the legs of last season’s inventory that you would already be discounting, or to test how much inventory of those new items to purchase. If you do most of your business online, it is still possible to achieve the same result. Create an unlisted section of your website with deep discounts and password protect it. Segment your highest revenue generating customers and create a campaign to let them know about the secret section and the password. This can create a sense of urgency that works especially well around the holidays. A crucial time in the customer lifecycle is right after a customer makes their first purchase. Trigger an automation after their first purchase that waits a couple weeks (give them a chance to earn another paycheck) and suggest your most popular product in the same category. If the margins on the product are high enough consider offering a discount. You are now well on your way to creating a customer for life. Let your customers know as soon as you have new inventory in stock. Create a segment of your customers that recently purchased an item from the same category and send them an announcement letting them know about the hot new item. Create a sense of exclusivity by sending it to them before it is available publicly on your site. Do you add new items to your store frequently? Consider automating the process with an RSS campaign. We are really excited about the potential opportunities this will unlock for your business and invite you to join the discussion over at feedback.activecampaign.com. What Deep Data Integration would you like us to create next?